Yardenit is a popular baptism site. Here, the water flows into the Jordan River, eventually flowing into the Dead Sea located more than 100KM (62Miles) to the south. This site is believed by some traditions to be the actual site where Jesus was baptized by John the Baptist (Matthew 3: 13 : "Then Jesus came from Galilee to the Jordan to be baptized by John"). It was an important turning point event in the life of Jesus. Many Christian pilgrims stop at this site and perform baptism ceremonies, normally in small groups and accompanied by the group's pastor. It is a remarkable, charming site - and should not be missed. The New Testament text identifies the place of baptism as "Bethabara beyond Jordan", but it is not clear where Bethabara is located, and there are several traditions on the site along the long Jordan River. Some point to the Yardenit area closer to the Sea of Galilee, some go south to Beit Shean, others to Jericho, way down the river. 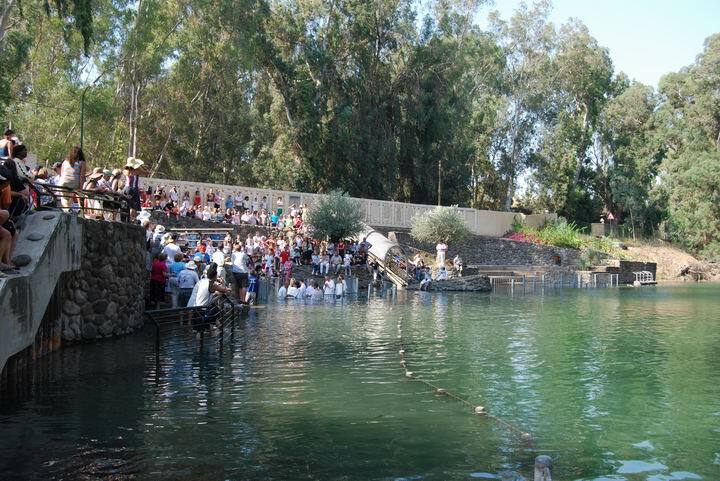 Jn 1:28-42:28 "These things were done in Bethabara beyond Jordan, where John was baptizing. The next day John seeth Jesus coming unto him, and saith, Behold the Lamb of God, which taketh away the sin of the world. This is he of whom I said, After me cometh a man which is preferred before me: for he was before me. And I knew him not: but that he should be made manifest to Israel, therefore am I come baptizing with water. And John bare record, saying, I saw the Spirit descending from heaven like a dove, and it abode upon him. And I knew him not: but he that sent me to baptize with water, the same said unto me, Upon whom thou shalt see the Spirit descending, and remaining on him, the same is he which baptizeth with the Holy Ghost. And I saw, and bare record that this is the Son of God. Again the next day after John stood, and two of his disciples; And looking upon Jesus as he walked, he saith, Behold the Lamb of God! And the two disciples heard him speak, and they followed Jesus. Then Jesus turned, and saw them following, and saith unto them, What seek ye? They said unto him, Rabbi, (which is to say, being interpreted, Master,) where dwellest thou? He saith unto them, Come and see. They came and saw where he dwelt, and abode with him that day: for it was about the tenth hour. One of the two which heard John speak, and followed him, was Andrew, Simon Peter's brother. He first findeth his own brother Simon, and saith unto him, We have found the Messias, which is, being interpreted, the Christ. And he brought him to Jesus. And when Jesus beheld him, he said, Thou art Simon the son of Jona: thou shalt be called Cephas, which is by interpretation, A stone".